But don’t get it twisted--we’re fiends for all things savory too. We don’t discriminate or choose sides when it comes to sweet vs salty. We are equal opportunity salt baes. 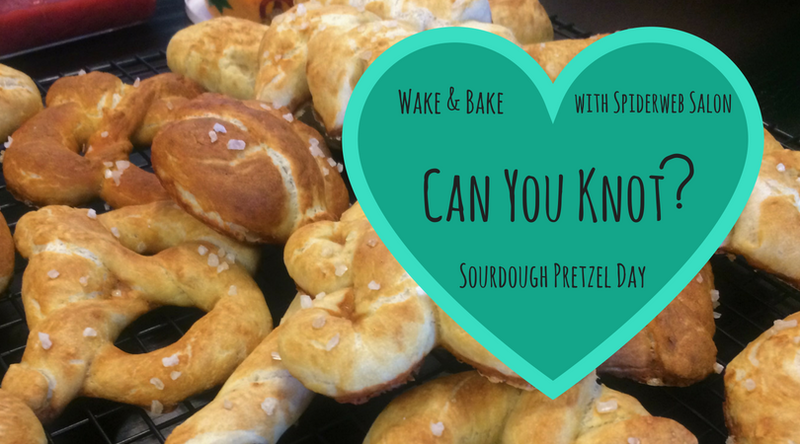 So buckle up, ‘cause today we’re taking you down the beautiful, winding path to Pretzels! Pretzel Day can only be made better with some friends thrown in the mix. We had some very special guests visit us in the W&B kitchen this weekend! Baking enthusiast and Spiderfriend Jamie Garner came by to watch us fling ourselves into this uncharted territory along with local vegan power couple Bonnie Jo Stufflebeam and Peter Brewer! Bonnie is not only an award-winning writer and longtime Spiderwebber, but she also runs the annual Art & Words showcase in Fort Worth and just so happens to be Spiderweb Salon's A-MAZE-ING art editor (check out the Featured section for her most recent write-ups of DFW-based artists like Joe Duncan, Matthew Long, and Alex Stock). Peter runs a super-cool local music studio called Easy Brew Studio and is capable of just about anything in the kitchen, especially when it comes to bread. Of course, Nina, courtney marie, Conor, and Corbin were there too, working on various musical projects and Spiderplans. Together, we prepared to tackle the ultimate treat. Jamie was eager to get her hands dirty, Bonnie was the ultimate cheerleader, and Peter jumped in head first with unbridled passion for sourdough, telling us about the extraordinary life of his sourdough yeast starter he’s been cultivating for over two years. His enthusiasm and fearlessness practically matched Caitlin’s, so it was really a joy watch these buddies throw down in the kitchen. With two mountains of sticky, yeasty dough at our backs, this ragtag bunch of pals joined forces to take on pretzel day, no matter what twists and turns befell us. The first round was the sourdough recipe, and we were honestly surprised at how sensitive this dough was. As soon as you picked it up and worked it on the counter, rolling and stretching, rolling and stretching, the gluten began to break down and get “stressed” and we’d have to just leave it be for a few minutes. I had no idea dough could get so easily stressed to the point where it needed alone time, but to me, this just explains the deep, spiritual connection I’ve always felt when in the presence of bread. Once we got the hang of this sticky cat’s cradle and practiced our twists, it was game on. By the time we got to round 2, our confidence was soaring. This particular dough, while slightly more viscous, seemed to be more forgiving in the stress department. Our pretzel designs became more adventurous and the creativity began to flow...I’m sure it had *nothing* to do with the bottles of wine that magically disappeared down our bellies. Was it confidence or intoxication? You be the judge...but really though, don’t judge us too harshly. Twisting pretzels is harder than it looks ok? Libations were earned! While riding the high of our success, we gathered around the kitchen table, stuffing our faces and dipping this salty, chewy, goodness into an mess of mustards. We continued conversations about the lasting magic of dough. How just two simple ingredients could ignite such a crucial, yet creative fixture throughout human history. One thing became abundantly clear: if we’re sitting around gushing about the wonder of bread, surely some of our readers might be interested in diving deeper right alongside us. This is where you come in. This is your chance to be a part of the Wake & Bake lifestyle! Apply today. That's right, friends. We’ve decided to host an exclusive baking workshop on June 30, 2018 to help 5 lucky readers get to know more about all things sourdough. Peter and his beloved starter will be joining the W&B Babes as we take you on a journey through the various stages of bread making, and our Production Assistant Chris Taylor will be joining our workshop leadership with a starter that's over 50 years old and a few doughy tricks up his sleeve! If you’re interested in this super exciting workshop, all you need to do is click here to fill out the form and write one paragraph about why you’d love to join us in the Wake & Bake kitchen! Please note, if you are one of the five selected to join us, the workshop will be FREE to our card-carrying Patreon subscribers (You can still sign up as long as it is before May 31!) and a fee of $20 plus a bottle of wine will suffice for any non-Patreon attendees. We’ll provide all the tools, resources, know-how, and ingredients, and you'll go home with your own jar of sourdough starter and all the knowledge you need to make a lifetime of delicious bread. We'll be accepting form submissions until the end of May. We cannot wait to see who will rise to the occasion! We'll announce our selected applicants the first week of June!